Hello My Love ...: That's a NO NO! 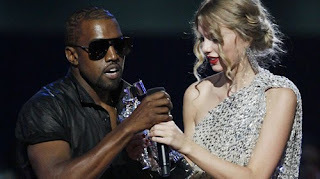 Ok. by now any one breathing should know about the disrespect that Kanye WHACK showed Taylor Swift an upcoming country music singer who one her first VMA award. Well, Kanye went up during Taylor's acceptance of her award and took the mic and said that Beyonce's Single Ladies video was the best ever. That's a NO NO. Who gave him the authority to be sooo rude? After I called him a jerk multiple times, I thought to myelf, why, why would he do that? Was he not thinking? Why wasn't he thinking? So this was my revelation; We all know that he is genius at what he does. He is gifted by God, but if he is not living for God and giving God true glory for the gift...grace begins to run out, wisdom begins to fade. I know that it's alot for celebrities to deal with being public figures and on top of it all his mother passing away but Kanye must remember the Grace of God that saved him from an accident that could have killed him. We as humans tend to forget the sacrifice that Jesus made for us. It's a NO, NO to hurt another person, either physical (Chris Brown and Rhianna) or emotional (Kanye West and Taylor Swift). So I was compelled to pray for Kanye and Taylor. My prayer is that they both would be comforted by the Holy Spirit and that they would have true revelation of who they are to God. I pray that their identity would be in Christ and that they would live for Him and use the opportunity that they have to be celebrities with wisdom and discerntment. In Jesus name! PS, I'm proud of the way Beyonce handled it. She apologized to Taylor and allowed Taylor to have her moment during Beyonce's acceptance of an award. Way to go Beyonce, you handled it with much grace.